If you want to look cute and standout from the crowd, then you better know these 30 awesome ways how to wear a midi skirt. This type of bottom piece is flattering on everyone, but still there are some details you should keep in mind before creating your next midi skirt outfit. If you want to wear a midi skirt without looking dull and tasteless, then you are more than welcome to tale a close-up look through these outfit ideas. We see pastel violet full midi skirt paired with black-white striped long-sleeve crop top, ankle-strap violet heels and wide-brim black-white striped sun hat. The midi skirt is a timeless garment that ideally works both for casual and professional hours wear. In today’s blog post I am going to share with you midi skirts outfit ideas for work and office wear. This style is a great choice for ladies who want to underline their uniqueness and creativity. 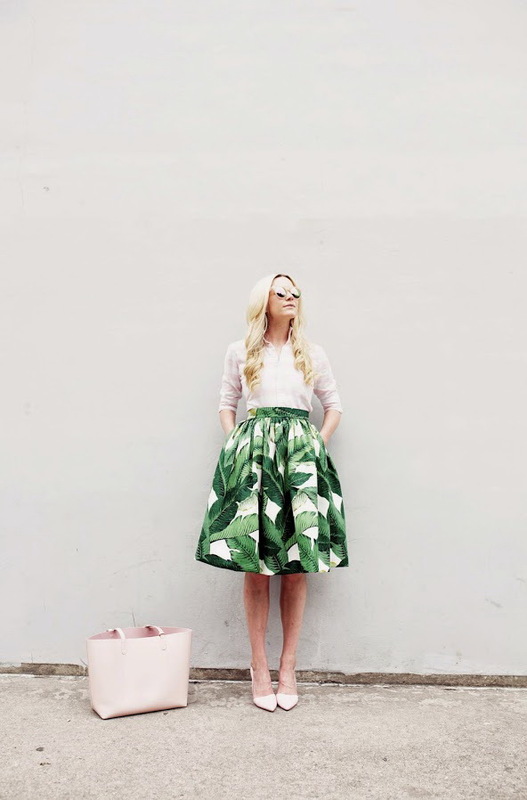 If you think your wardrobe is boring and basic, midi skirt is an ideal and inspiring solution. Trust me, the showcased designs will make your office outfits look fancier. It’s long enough to be appropriate for work, as well as for after-work dinner parties. Of course, everything depends on its silhouette and fabric. Scroll down to see inspiring new ways to wear go-to skirt this year. In this street style collection you will find best ways how to make midi skirt look trendy on you. We see a vintage look that consists of a peasant lightweight floral midi skirt worn with a pink T-shirt completed with a dark green knitted cardigan. At first glance, printed midi skirt might look complicated to style, but once you take a close-up look, everything changes. Believe me, this bottom garment is very easy to wear. Personally, I am obsessed with midi skirts at the moment, I’ve got three designs in my closet. The first one comes in a solid blue color, A-line silhouette, the other one is black with sheer panels and third style is printed in geometric pattern. In today’s street style collection I decided to share with you my favorite outfit ideas on how to style printed midis. I am pretty sure, there will be no problem for you to get inspired by these looks. Below are picked my favorite printed midis to try on next week. This eye-catching design will be a perfect addition to your wardrobe. Scroll down to find out more. A blush sleeveless top is a great way to keep things matchy and ladylike. Try it on with striped blush-white midi skirt. Complete this look by adding mirrored rounded sunglasses and light pink tote bag. I love midi skirts for one simple thing, they work for every season. Anyway, in today’s blog post we will see stunning printed midi skirts outfit combinations that work for various occasions and weather. This style comes with a functional hemline that ideally suits office ladies, as well as old women and librarians. In this street style compilation is gathered gorgeous selection of printed midi skirts that will easily give your wardrobe a boost. You are about to see all kinds of styles, including the ones inspired by hippies, 1960’s, 1970’s decades. I am 100% sure, there will be no problem for you to create a beautifully put-together look by choosing one of these bottoms. Cream white day shirt is tucked in high-waisted A-line pleated skirt in palm print. Complete this outfit by adding mirrored rounded sunglasses, pointed-toe white pumps and blush tote bag.